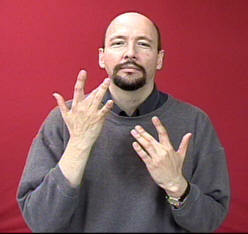 FRUGAL: Form your hands into 5-handshapes with middle fingers bent at the top knuckle. 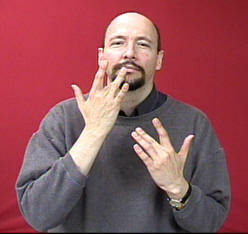 Each hand moves in a circle toward the chin, touches the chin, and moves downward and then away. I touch twice with my right hand only only once with the left hand. 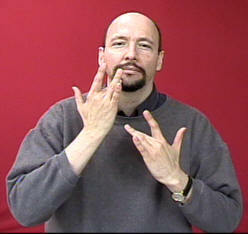 Thank you so much for being a wonderful resource for those of use that want to learn more about ASL. 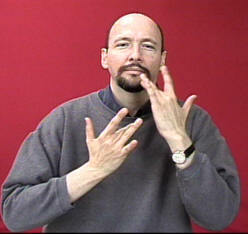 A man was talking about "freelance" terps and used the sign that is the "middle finger" alternated off the chin....several laughed...his comment was that, freelancers always poor/scatching to make ends meet...so that is why the sign is appropriate...i have seen a signed concept close to that for honeymoon. I have seen and use this sign for "free-lance" interpreter, i am just not sure why this would be funny....because it is closely related to another sign??? That sign means "frugal" or "watching every penny." It can be used to mean, "just getting by." So when applied to "freelance" interpreting, it is a way of saying that freelancers don't get paid much. Another similar joke is to sign "freelance" using the sign "BROKE-financially."